The Best Eye Make-Up Remover- Just 3 Ingredients! Hi all! Today I want to share with you the best eye makeup remover recipe I’ve come across in a long time. Now, I’ve been known to love a good long lasting mascara, but sometimes I hate it too, especially when it refuses to come off. So today I’ve got a really good, super simple, homemade eye make-up remover that costs waaay less than your favorite name brands and works just as well. Alright, so this is so easy! All you need to do is mix in your essential oil with the jojoba oil first if you’re using an essential oil. This will keep it from separating from the other ingredients. I used 1 drop in 2 TB of jojoba oil. Next, fill up your jar or bottle halfway with the baby mild castile soap. Now fill the remaining half with filtered water almost to the top. Be sure to leave some room for your jojoba oil otherwise it won’t mix well. Next add your essential oil infused jojoba oil to the jar, cap it tight, and shake it up. Everything should mix together really nicely. At this point, feel free to use a cotton round or soft cloth to dip into the best eye make-up remover ever and get that pesky mascara to practically jump off your eyes! This stuff has even worked to remove the ever clingy Aqua Smoky Lash mascara by Make Up For Ever. GREAAAT mascara (though not natural in the least…boo) that gives my lashes some real oomph. Now I can finally enjoy wearing it without dreading its difficult removal. This eye makeup remover will also remove eyeliner, eyeshadow, concealer, and more! It’s made with all natural ingredients that are gentle on your eyes and your body! This oil is the best when it comes to matching your skin’s natural oils. It doesn’t over dry, imbalance, or cause breakouts. In fact, it does just the opposite! Add it to this recipe and it will last considerably longer than without it. Lavender also support healthy skin and is known to help smooth fine lines which is extra nice around the eye area. 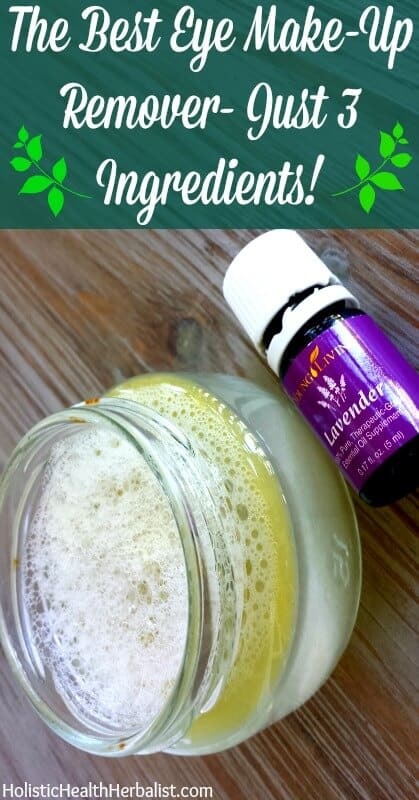 Using this oil will also add a calming element to the recipe which is a huge plus! You can get my favorite lavender essential oil here. For moremakeupp remover recipes check out the articles below! Does it need to be a glass jar or bottle or can it be plastic? Hi Tabitha! you can store this in any container you like 🙂 I just love glass! How long will this last for in the bottle? I used 1/4 cup mild baby castile soap, 2 TB jojoba oil, and 1 drop lavender essential oil. If the blend burns, I would use less soap and more jojoba oil 🙂 I hope this helps!